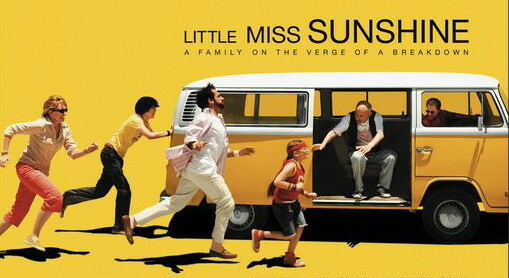 Little Miss Sunshine is a thoroughly enjoyable laugh outloud kind of movie. I came out of the screening energized and enthused, as did most of my colleagues, and my day felt a little more chipper for having seen it. It was clear to me why this road movie about the dysfunctional Hoovers was a Sundance darling and why Fox Searchlight bid ten million for distribution rights. 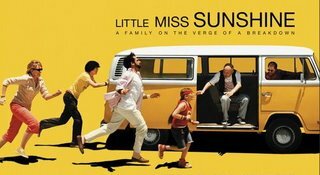 What I didn't expect was that some critics were up in arms about audiences feeling good about Little Miss Sunshine, moreorless insinuating that they just didn't know any better, a very tired trope that still packs some clout in certain circles. Or perhaps, I should say, in certain squares. Because there are many kinds of artistry and providing enjoyable entertainment is, in my book, one of them. My thanks to Shelley Spicer of Terry Hines & Associates who arranged for a roundtable discussion with myself, Omar Moore of PopcornReel.com, and the husband-wife directors of Little Miss Sunshine—Valerie Faris and Jonathan Dayton. We all hooked up at the Ritz Carlton for a breakfast session. Valerie and Jonathan have that endearing Altmanesque quality of overlapping and finishing each others' sentences. Maybe I should just call it marriage? Omar Moore started things off by stating the characters portrayed in Little Miss Sunshine are wonderfully real people, with whom it's easy to identify for all their faults and foibles. Particularly impressive for Omar was Frank (Steve Carell) whose arc transforms him from suicidal ideation towards an eventual acceptance of life. "I think our interest—even going way back to when we started doing documentaries—has always been in character and people," Valerie explained. Even in their music videos, it was the personalities of the bands they worked with that interested Faris and Dayton. That's why the film appealed to them. It had six interesting characters and they related to each one of them as real people. "When we met with Steve Carell, we didn't know he could do this based upon what he had done. But when we met with him and talked to him about the character, the tone of the movie and the way we were approaching it, he was right on the same page with us." They wanted to respect the characters, to not laugh at them and to journey with them. It was important to make the Hoovers feel like a real family with history, and that the film was merely a glimpse at a three-day period in their lives; lives that extended past this three-day period. So they worked in rehearsals on developing relationships between the family members and building a sense of their common past. That's part of what made them so real. In Carrel's case, he was an amazing actor who loved his part and his character. He was smart and funny, Valerie described, without needing to be funny all the time. Jonathan added that there were many factors that led to all the good performances in the movie. Certainly, it began with Michael Arndt's writing. "Michael, to his credit," Jonathan explained, "writes characters who have longings that reach beyond the immediate needs of the story." Some characters feel like they're existing solely to serve the needs of the immediate story and they don't really dream beyond what's happening in the now." 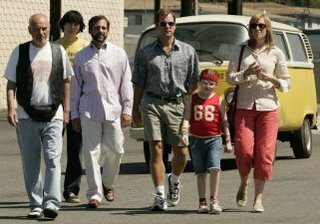 Whereas in Little Miss Sunshine all six characters have giant lifelong dreams. That's something you immediately identify with because, of course, hopefully everyone has those dreams in their lives. "The characters become more universal because of that," Jonathan continued. Carell was excited about stretching out. He had shot Forty-Year Old Virgin, which wasn't out yet, and that had certainly been a big step for him. Little Miss Sunshine was yet another jump into true drama. There are moments Carell has in the film that are plainly not humorous and, thereby, challenging. Jonathan was glad that all the actors were there to support Carell. "We were certainly interested in creating an environment where he could do that." What impressed me as a self-identified gay male was the portrayal of Frank as a conflicted human being like everyone else in his family. There wasn't any need for any kind of kneejerk politicization of his character. His universality came across not because of his gayness but because of his humanity. I commended Valerie and Jonathan for presenting him that way. Steve's performance, along with the performances of the entire ensemble, were perfectly poised. I asked how they had achieved that egalitarian parity among the ensemble? Valerie responded that what they loved about Little Miss Sunshine was precisely that it was a true ensemble piece. "There really isn't a protagonist," she pointed out. "If there is one it's Olive, the little girl. Most of the scenes have all six characters in them and that's what drew us into it. We get to create this sense of a family in an ensemble, and the way they then are able to work together as actors instead of each person separately doing their lines, doing their scene. Each scene you see them, they're interacting. Those scenes were played in long pieces so that they could really develop at their own rhythm. Maybe that's why it has a sense of reality because it's their real timing. It's not created and stylized. It's real time pacing." By example, the dinner scene is one of the longer dinner scenes in any film. I quipped, "Chicken again!!" and we all laughed. Jonathan filmed "five million takes" so the actors could sink into character and begin "boxing with their fellow actors." "If we could create what feels like real life in these five-minute scenes," Valerie offered, "it's more like we're just shooting a documentary. We kept thinking let's try to make this family feel like we're just following them. That there's actually something happening between the characters instead of each shot you're trying to create something. So much of it was really happening between the characters. Frank is an interesting character. We thought of the dinner scene from his point of view. He's the outsider coming into this family and it's the last place he really wants to be. But he's taking it all in. He hasn't spent much time there so, for the first time, he's sort of, 'Oh my God, this is my sister's existence.' Immediately he's probably one of the first characters you identify with in watching the film. There aren't that many movies where you identify with a gay suicidal Proust scholar." "That's what's so great about the writing," Valerie stressed, "is that somebody could hear 'gay suicidal Proust scholar' and think, 'How can I relate to that character?' " But you do, partly because of who Steve is and all the warmth he brings to the role. "The story allows you to enter these very different experiences in different people. I always felt completely drawn into them. It wasn't like you're watching them from a distance. I always felt they were very easy characters to identify with. I don't know if that's going to be true for everybody." Omar noted that Richard Hoover, the father character played by Greg Kinnear, wanted the best for his family. He had idealistic hopes for his children and sometimes, of course, things didn't go according to plan. "How much do you think what you've done in terms of that idea of trying to provide for a family resembles something like It's A Wonderful Life?" Omar asked. To what extent did other films influence Little Miss Sunshine? Because when he saw the movie he sensed its Capra-esque qualities. Jonathan remembered being influenced by Capra's films as a child. "We all look to film to tell us about the rules of life," he said. "Certainly, in America we're taught that if you work hard and play by the rules, you'll be rewarded. What was interesting about this film is you have these guys who are trying their best to do what is expected of them and it may not pan out for them. We thought this family was an interesting modern middle-class family because—even though they have a house and the two cars—they're actually teetering on the edge of financial disaster." Valerie ran with his thought. "You can have the house, you can have the car, but it's always at risk." Another thing that appealed to them about this story was the struggle of this average family. "It is so hard to keep a family together and actually do something." As ridiculous as Richard's pursuit of his self-improvement program is, he's trying so hard and ultimately there's some sort of payoff in that he does keep pushing the family and keeps them chaperoning Olive to her dream. The fact that they do make it to California redeems Richard. To celebrate the effort as well as the end result was important to the directors. "We devalue experience and only value achievements and results," Valerie complained. "We liked that it was really about the experience. That's what they gained." "This is a film that compares two value systems," Richard added. "Looking at life as a contest versus looking at life as a dance." The first words in the script are when Richard says, "There are two kinds of people in this world: winners and losers." Through the course of Little Miss Sunshine, the Hoovers' adventures teach them to see life more as a dance, where they can find joy, and prevent others from judging them by not subjecting themselves to judgment. Valerie agreed. "So many people feel like they're put to this test constantly. We're such a winner-oriented society. America has to be the number one super power. There's this oppressive attitude and it's liberating to take charge and enjoy your life." She stressed how important it was not to devalue what you have. Including relying on family, I mentioned. "It's funny," Jonathan commented, "because you hear so much about family values and we told the cast, 'This is really about the value of family.' Which is a very different thing. Hopefully there's true power in seeing people who actually love each other." Even though they're so different from each other, Valerie interjected. "Beneath the arguments there's something that endures," Jonathan insisted. But Valerie maintained that all families are not that way. Some are rotten and they hate each other and there's good reason. She cautioned against making general statements. "Our experience," she said, "has been that [family] is the place where you can be at your worst. There are very few places where you can go at your lowest point. Frank, where does he end up? He ends up with family. There are no friends rescuing him from the hospital; it's his family. It was great to see him go from judging all the characters at the dinner table to actually totally being part of that family." Since the character of Richard had been brought up, and cognizant of their background in music videos, I expressed my respect for their selection of music in Little Miss Sunshine, particularly the scene where Richard is on the motorcycle on his way to "make things right" with La Llorona playing in the background. Valerie was surprised I knew the song. What self-respecting Chicano wouldn't know La Llorona? I asked how they chose their music. "It was very important for us to find the right sound for this movie," Jonathan asserted, "We hoped that we could find it before we actually filmed the picture because that's how we worked for years and we've found that music informs our choices." Valerie concurred they were inspired by music. Who they discovered was a band out of Colorado named Devotchka who have a hybrid sound between Latin and East European music. The four members of the band play multiple instruments, including tuba and trumpets. "We heard them and we just said, 'Oh my God. This is the sound.' " Jonathan recalled. "We wanted to have music up front and really use it for all it can give and, at the same time, we didn't want to use it as a crutch. Today so often you'll see a scene and they'll bring in a pop song with a lyric line that will tell you—as if you don't know—what you're supposed to feel." They didn't want that. "We cut the whole film without any music, just letting the rhythms of the scenes find their place and then when that felt right to us it was thrilling to then bring in these songs." La Llorona was on Devotchka's album and, as Valerie described it, they found the song "perfectly bittersweet", both sad and hilarious, with a "sense of perseverance." The music, Jonathan furthered, had a "vibration of all these different qualities. It's not just Sad Sack. Hopefully what's fun about this material and these performances is that they aren't a single note, they're chords, they have these other things going simultaneously." Omar returned to the idea of a dance in life versus a results-oriented mentality, which made him consider the road itself as a metaphorical process, not only in how it furthered the script but how it influenced the actors' performances. The metaphor of the van that's on the verge of breaking down on the journey was a conscious metaphor of the Hoover family. "The van was a little bit like a test tube or a petrie dish," Valerie explained, and the actors were put into this hot, noisy, shaking vehicle. It was important for them to shoot all of the car scenes on the road, no green screen, no studio versions of people driving in a car. So it was uncomfortable and necessarily rough on the actors. Most of the time all six of them were in the van together. "You're on a freeway and you can only shoot in one direction so the light doesn't change. You shoot one way, then you have to turn around, then shoot again. It's not comfortable and fun but they still loved each other. These guys got along great. They still had fun. They went through the miserable experience together." Jonathan suggested it helped the actors bond and Valerie agreed, adding that the scenes were shot in sequence so that the van ride came after the dinner scene. "You started to feel certain tensions building between Richard and Frank. It was very easy to tap into the frustration and anger because it was a tough shoot. The experience of being in the van together and shooting that way helped support what was going on in the story." I asked if they anticipated the response they got at Sundance and how they reacted when they received the $10 million bid from Fox Searchlight. Jonathan said they weren't expecting anything at all. They were too busy finishing the film, which was accomplished on a Wednesday before the premiere on Friday. Though they had screened it for friends and had looked at it in its entirety, the sound wasn't finished. The Sundance screening was their first time in front of a real audience and the first time they literally saw it end to end. "You're partly just fearing, 'Oh God, is something going to be missing? Is the sound going to drop out here?' " Valerie confessed. Sundance was the perfect place to introduce the film, Jonathan recalled, because it's an incredibly warm, receptive, interested audience. That was amazing enough in itself but then they were so happy when they sold to Fox Searchlight because, first of all, "they seem to really love our movie [and] seem to understand how to market films like this. They're doing a lot of word-of-mouth screenings, which is really our preference, to just let this be a word-of-mouth phenomenon, not something that's heavily marketed and sold. I really like being considered an indie underdog film. We're kind of teetering on the edge because—let's be frank—it was made for very little money. It was made like an indie film but we have big stars." Valerie added, "The fact that Steve Carell is in it did—all of a sudden—focus a lot of attention on it. Even before we got to Sundance there was interest in the movie just because he was in it." They had spent so long trying to get the movie made that they never expected the Sundance reception. It had been so hard to convince people that the film was worth shooting. The idea that it would be so well-received never crossed their minds. They just wanted it to be done and were amazed that they got it done and were happy with it. That was as far as they could imagine anything. Returning to Omar's description of the film as Capra-esque, I brought up the complaint some critics have that the movie is derivative. They were both well-aware of that critique. "Personally," I qualified, "in the audience I was in, they were laughing so uproariously and my reaction was, 'What's wrong with going to a movie and enjoying a movie? Who cares if it's a story that's been told before if the retelling still works?' " What distinguishes Little Miss Sunshine for me was the direction, the writing, and the ensemble performance. I asked how they felt about the criticism that Little Miss Sunshine was "derivative"? "What isn't derivative?" Jonathan countered. "I think it's derivative of my life!" Valerie laughed. "It's more derivative of my life than films we have watched. We love film but we're not film scholars." And Jonathan insisted they were not interested in quoting other movies or other filmmakers that they love. Valerie added, "We love Capra and what it is we love about him is he did make movies about the common man—mostly men, but, y'know, we can change that maybe. I love that about him but I don't have any desire to quote [him]. We certainly weren't looking at other road movies and saying, 'How can we update this form?' We were more interested in the story of the family and how it felt like our lives. It's funny, but, maybe it's accidental there are things that seem like references to other movies." Jonathan acknowledged that there are other movies like National Lampoon's Vacation, which they haven't seen. But he was happy to hear my reaction because, truth be told, they welcome criticism and people examining the movie and opening it up, but if people start getting into this game of comparing the film with certain plot lines, then they've really lost. My reaction is exactly what he hopes people will have, which is that they'll be moved, that they'll have an emotional cathartic experience. He hopes they'll look at that aspect of the film and not become too caught up in some kind of game of charting resemblances to other films. Valerie summarized, "If you're not going with the film, if you're just going to sit back and watch it for those things, you can criticize it all you want. You can't expect to win everybody over. I'm just thrilled that some people go with the film and enjoy it and go for the ride. That's really what you hope. If you let yourself do that, I think it's a pretty fun ride. But not everyone likes rides." Dealing with reactions has been a new experience for them. Jonathan enjoys looking at blogs, finds them fun to read. "With the online world now you can really get instant feedback." Valerie doesn't go there so much and lets Jonathan tell her what he's read. "I'm glad to hear that," I told them "because this year is the year where a tension has kind of been created between print press and what's being called the 'citizen press corps.' When you said the word-of-mouth thing, I thought, 'Yes, this is what's going to make this movie work.' Maybe the critics have seen too many movies and they want to find something derivative but word-of-mouth is going to sell this movie." Valerie could only hope that would be true. Omar was curious about what transitional challenges the couple had shifting from their work in commercials and music videos to filming their first full-length feature. "The biggest challenge for us was to create living scenes in the film," Jonathan answered. "In music video and commercials it's storytelling by frame where you draw your storyboard and you cage your actors and their stories in that frame. You have 30 seconds to tell that story or three minutes to tell that story and you have to use a shorthand in commercials that may not always be lifelike or true to life but you need to compress. But in the film we really decided that our frontier was going to be to get great performances and to create a lifelike environment." Valerie explained that they wanted to create that lifelike environment in front of them through the interaction of the actors and not just through the lens. "If it's happening in the room, if they're interacting and there's something really happening there, you can pretty much put your camera anywhere. We had very specific places we wanted the camera. But you can't create it just in your shot. It has to be happening. With an ensemble film, you have to create the life between the characters." "So it was more about staging," Jonathan replied. "Also, we're really into movement. You can get so involved in the camera movement and the actors are all just standing there doing their lines. So what we did, we really worked ourselves. We staged the movie. We staged scenes from the movie for years prior to actually shooting. It took five years to make so within that time we workshoped. We decided not to wait. We decided to explore these scenes. We had a chance to see how to stage the scene where the woman comes in and tells them that they can't take the body, they have to fill all these forms, we did those scenes and we started to understand how they worked so that when we went to shoot them, we had a greater knowledge." "The difference is we had three and a half years of prep on this movie," Valerie added. "Commercials and videos, you do it in a month and you're done. We lived with these characters. We lived with this story. We didn't put it down. We kept it alive for ourselves because we believed in it. We believed it would happen even though it was really discouraging at times. The fact that they became a part of our lives, it's almost as if we were part of this family. The time you spend with something makes the process of actually making the film so much easier. It felt very organic to finally get to bring it to life." I asked how the story came to them, did Michael Arndt bring it to them? "He wrote it as a specs script," Valerie answered, "and he gave it to these producers Ron Yerxa and Albert Berger who produced Election. Michael had met them when they were doing Election. So he asked for the script to be sent to them and they'd been giving us scripts for years so they gave us the script. I credit them because I don't know if somebody could look at our past work—the videos and commercials—and say, 'Oh yes, this is a perfect match.' They knew us well enough to know that we would respond to this material. I don't know how we got it, there were 14 other directors, but we just liked it so much. We went in absolutely determined and not willing to let them give it to anybody else. We're passionate about it and passion is worth something. It is so important to be that passionate about something when you do it because it's a lot of work and it's so rewarding when you really love it. So we're hoping that will happen the next time." Omar enquired about their working process since they're both directors on the set. "Does either one of you do something more particular than the other? Are there one group of tasks that one does versus another? Because the actors are coming to you and they're seeing two directors. How does that work?" "We both do everything," Jonathan replied, "and the key is to be prepared so we really do work out everything in advance. Having said that, there are always things that happen on the set that you don't expect and you're happy to fan those flames. A little exciting idea happens and you want to encourage it. Val and I in a way are like this idea incubator. Having the two of us as this kind of safe zone to talk about any idea, no matter how silly, allows us to entertain things that I know, myself, I would never speak openly on a set. But when you have someone that you trust and you can be vulnerable with, you can encourage ideas that otherwise would never see the light of day. Then when we talk with actors, we're very aware that this was a giant issue. That you couldn't in any way set up a situation where they would hear mixed messages. So typically after a take one of us would have a strong feeling and we'd discuss it and then that person would go and talk to the actors and then they would continue to talk to them throughout that scene." "It's usually per scene," Valerie qualified. "I'll work with Greg on this one part of the scene. Jonathan will talk to Toni more on that scene. We kind of tag team but it's not consistent throughout the whole film, it's just scene by scene. It may be that he has a stronger feeling about something that we're looking for, that we're trying to get, and he may have a stronger feeling about how to get it from that actor or I may have a clearer way of expressing it to the actor. So we'll just talk and we're pretty much always about five inches apart and we're [she whispers in his ear] and then one of us will go and be the messenger. It's funny, but we're a lot like one director except that, hopefully, we have separate heads. We are sensitive to the fact that it's different for the actors but we never heard anybody even [complain]. They forgot about that. You just become an entity. We were a directing entity." And part of the ensemble, I suggested. "Exactly," Jonathan agreed, "No, it really is that." "And filmmaking crews are ensembles," Valerie offered, "If your crew is all in sync, if everyone's on the same page, you're always exchanging ideas with your DP, with your production designer, with your costume designer, it's a collaborative process, it's not dictatorial. I guess some people think that's what directors do. They stand there with a megaphone and tell everybody what to do. I would hate to direct that way. I love working with a group of people who are all invested, and all have ideas and all contribute. It's just an extension of that." I brought up their choice of Abigail Breslin, who I consider the new guard after Dakota Fanning, and enquired how they found her. Jonathan said, "When we got the job years and years ago, the very first thing we said is, 'Thank you and now we got to find Olive.' " They both realized there was no way they could make the film without the right actress in that role. Obviously they needed to find the right actors in all the other roles but if they didn't have Olive, they really wouldn't have a movie. And they knew it was not going to be easy because there were a lot of child actors out there who just don't have life, who to a certain effect aren't children anymore, they're mini-adults. Not unlike the contestants in the Little Miss Sunshine Beauty Pageant, I said, who I found scary. "The first thing we were able to do was to get some seed money to start casting," Jonathan outlined, "and we worked with these two casting directors, Kim Davis and Justine Baddely, who had done all our videos, who had done many films as well, and they launched a worldwide search and they had representatives in every English-speaking country, in New Zealand, Australia, the United Kingdom, all over America, Canada, South Africa. We looked everywhere. They saw hundreds and hundreds of girls and they, thankfully, whittled it down for us. But really the only person that struck us as being right was Abby. We saw her when she was six and she was almost too young at the time. We continued to look but we kept an eye on her. "What was it?" I asked, "What was it that you saw?" "She's just got an intelligence," Valerie described. "She's very present. A lot of kids have trouble focusing for any length of time. Whoever she's acting with, she's really listening to them. She's a really good listener. Most kids they'll spit out their line and then they're gone. They zone out. And then, 'Oh, c'mon, your next line's coming' and then they'll spit that out. But she can play a six-minute scene, five-minute scene, and she's there for every line. And the way we saw that, you can see it just when she auditioned, she did the grandpa scene, you could see that she was in that moment. She's in the scene." "She didn't overdo it," Jonathan furthered. "She was one of those people who actually was very plain. It wasn't like she was turning on the charm, 'Let me show you this.' There were no fireworks. She had the ability to be natural. We really credit her parents. Her mother was not a stage mother. When we met Abby and her mom, we were looking at the mom as much as her. You don't know what you're in for. We've done so many Gap Kids ads so we've seen every stage mom you can imagine. Kim, her mom, was as much a selling point as Abby." "Abby's still a kid," Valerie added. "She interacted with all the little girls at the pageant. She got down and played with them. It wasn't like, 'I'm the star of the movie.' She was playing with them, teaching all the other girls her dance. She had a really good time with them and you could see they actually had a little kid in them still, but you never see it on film. Abby is a very level-headed little girl who has been brought up well. She doesn't act like a little star. She always came completely prepared. She knew her lines. Most kids in films you're prompting every single line." At this stage we had to wrap up our roundtable, so after thanks and congratulations, I quickly asked, "Where can I get a 'Jesus Is Wrong' t-shirt?" Keith, thanks for stopping by. I hope this reaches your part of the world too. And yeah, I have my days of purposeful non-communication as well.